Z’Anne’s passionate goal as an artist is to honour the ideas of transparency and exactness in oil. 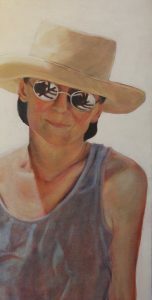 To achieve depth and glow in her work, she employs the Renaissance technique of multiple glazes, her subject matter ranging from portraiture to complex depictions of water and forest. Our Saugeen Watershed is a constant source of inspiration. Whatever the subject, the perennial challenge is that of creating a unified and “painterly” canvas with pops of juicy colour. Hard work, but joyful, like the company of other artists. Please feel free to contact me via my email or phone to find price and availability. Almost all of the paintings are available in giglee form if the original is gone.